We’ve covered the lower end in the previous blog. There are mid-tier, premium, and art object categories remaining. Three features get pushed a lot as shortcomings of the Stanley Bailey design – thin blades, thin chip breakers, and frog to bed seating/contact area. The more expensive plane makers, and aftermarket parts sellers, claim their thicker blades and chip breakers and the increased frog contact area will solve all your problems. This is marketing hyperbole to sell product. I will reiterate again – if your plane won’t cut right, it’s a tuning issue (or something’s broken), and thicker parts just mask the real problem. The better materials (A2, PM-V11, etc.) will improve edge life, and a thicker blade will continue to cut longer before chattering and stuttering compared to the thin counterparts. The increased frog contact area helps here as well. While I have aftermarket blades and chip breakers, I elected to get more factory blades and breakers and have them ready to go so I don’t get in the middle of a project and need to sharpen. This is a very expensive proposition with aftermarket blades. Tighter tolerances (less tuning, better adjustment control, easier to use), ductile cast iron (if dropped on a hard surface it won’t crack), longer intervals between sharpening, and bevel up planes are the main things you get with the more costly planes. Another is handling grain tear out in unruly wood. The task that standard bevel down bench planes struggle with is planing reversing grain without tear out. 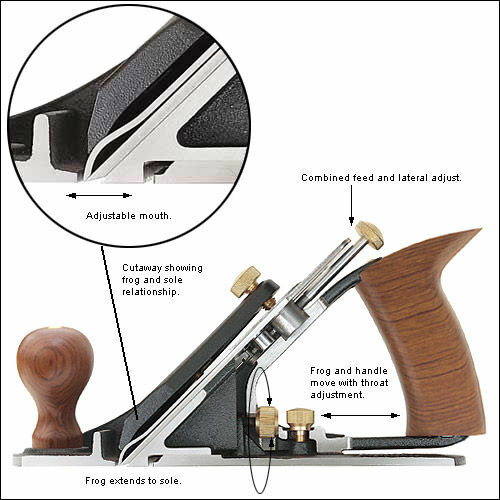 Even the premium BD bench planes struggle with it – why does LN offer steeper angle frogs? My handplane performance blog has tuning methods to help, but the plane design can only do so much. High angle planes are designed for this task, but are more difficult to push so you only want to use them when you really need to. I bring this up because many folks think going to a premium plane will solve this issue. While a 45° bedded bevel down premium plane may do a little better than a low cost one, it won’t be an order of magnitude better. The blade cutting angle has to be increased to get the improved results. 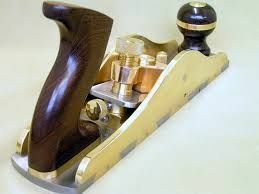 I put the WoodRiver planes from Woodcraft and the “new” Stanley Sweetheart planes in this category. One of the Stanley’s is a bevel up bench plane. Less money than premium planes, not quite the manufacturing tolerance control, looser adjustments, some tuning and burr cleanup required vs the premium planes. They will perform well once tuned up. For North America, there is Lie Nielson and Veritas by Lee Valley of Canada. Europe has Clifton, which are imported to the USA. I have read, but do not have any experience, that Clifton quality can be a bit hit or miss. Since I have no direct experience with them I will leave them out of the discussion. Lie Nielson and Veritas are a toss-up from a quality and results perspective. Both manufacture high quality tools that will last several life times, with great customer service. For all planes except the bevel down bench planes, I prefer Veritas because they offer additional features and cost less than equivalent LN planes. Features like lateral blade set screws and mouth adjustment stop screws make the LV planes easier to use. If you like nostalgia and/or a little more bling on your tools, then LN is probably your choice – the classic Stanley designs with tight manufacturing tolerances, and they are dressed nicer than LV planes (for tools I focus on how they work, not how they look – my brother prefers LN). Also, some folks just don’t like the less curvy and more vertical rear tote on Veritas planes. I prefer my own design over both the Stanley/LN and Veritas tote designs. 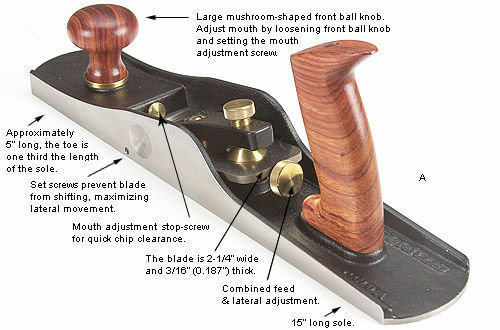 Bevel down planes – Veritas uses a Norris style blade adjustment on their BD planes (see below). The same arm with knob control blade depth and skew, and you cannot reach the knob with your fingers with your hand on the tote like the Stanley design. I don’t have an issue with it, and the design works very well. However, kind of like the rear tote, some folks just don’t like it. The design will change habits that were formed with the Stanley design, and I suspect this is where the “no” votes come from – “it’s different and I don’t like it”. All the other additional design features Veritas has in their BD bench planes make them superior to the Stanley design, but this is enough of a difference in how the tool functions that it can be a deal breaker. If you are not familiar with bevel up (BU) bench planes, visit this site http://www.leevalley.com/US/Wood/page.aspx?p=45864&cat=1,41182,52515. The primary advantage of this plane type is versatility – the ability to vary the blade cutting angle by regrinding the blade or having extra blades already prepared at different angles. Angle of attack is everything when handplaning. The standard bevel down plane has a cutting angle of 45°, which is a compromise. End grain is best handled at 37° (12° bed + 25° bevel – less bevel degrades too quickly), straight grain at ~45°, and reversing or burled grain up to 62° or even higher. Included just in case you were not aware of them. 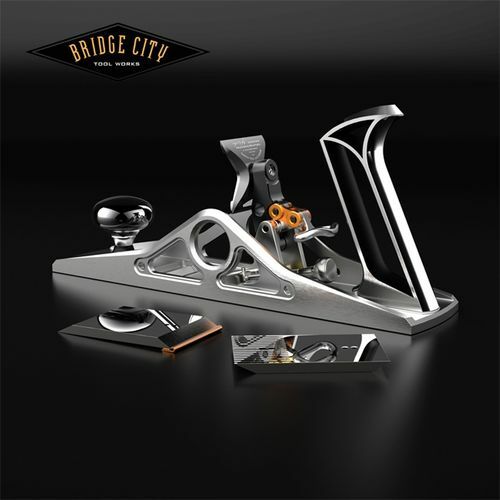 A couple of extremely high end planes: from Bridge City Tool Works on the top and Marcou Planes on the bottom. I’m sure there are others. I don’t even know what they cost – if you have to ask don’t bother. I’ve never used one, but I’m sure they are good. I think they’re intended to sit in a glass lighted case. Lots a choices ain’t there? The only quick fix is a premium plane at a $150 or more cost adder, which could buy you 2-3 more low cost planes. A lot of the decision process comes down to money, as with many things. If you have the money, go for that LN or Veritas. If you don’t, my recommendation is to find someone with well tuned low cost planes you can try out so that you know how one acts and feels. It’s worth the gas money to drive a couple of hours if needed. Perhaps a tool dealer would allow a test drive – take your own wood and a broom and dust pan. Make sure the blade is sharp enough to shave with. Take oak, hard maple, something with some difficulty. Soft stuff like fir, pine, poplar is too easy. A well tuned plane will sail through hardwood. They might even have a plane at reasonable cost that you take home. If these aren’t options, start with the low cost Stanley design 4 or 4-1/2 and follow my tuning blog (or others) to get it humming. Yes, it can take hours upon hours to educate yourself on tuning and use. I view the time I spent learning about handplanes as some the most interesting, frustrating, and best time I’ve ever spent woodworking, and some valuable education. Maintain faith that many have been successful at getting those Stanley planes to work. Just a little snide addendum regarding the marketing of planes. For the most part, the premium designs were just a way to try to sell planes to people that already had planes through creative marketing. Many people were surprised to find that the regular Bailey pattern planes that had been working perfectly just fine around about a hundred years actually needed improvement. I guess it is much like someone wouldn’t be caught dead driving less than a Mercedes Benz or a Rolls Royce. Premium planes must fulfill the same role. Also, you have to really wonder, why would anyone spend $10,000 for a plane? Talk about conspicuous consumption (or compensation). The low angle bench planes were tried and abandoned by Stanley nearly 75 years ago. Sure hope the current makers have solved the mouth chipping that the originals were prone to. At any rate, it makes little sense to buy one instead of just using a regular block plane. Of course the block plane blade is 1/2 in narrower. There is a lot of great looking planes to choose from if you have the money. Paul Sellers has some good videos and he has used a regular #4 Stanley plane for about 50 years and does some incredible work. One of my favorite planes is a $20, #3 Stanley; purchased on Ebay. After a few hours or cleaning, sharpening, & tuning it works as good as any other plane I have used. No matter how much you pay for a plane, if it is not sharp and set up correctly it will not work well. I think you meant WoodRiver from Woodcraft, not Windriver. Thanks for the catch 7Footer – corrected. Always miss something no matter how many times it’s proof read. I’m still a vintage guy. I don’t think its necessarily a cost thing. I’ve got some LN and LV tools. I still grab for the vintage in most ( but not all) cases. David, I suspect the issue with the original #62’s was material – plain grey cast instead of ductile like LN, LV, and the new Stanley use, and industry casting practices certainly weren’t as good back then. Using one as a jack plane, with heavy interrupted cuts, would have increased the chance of chipping of the grey cast as well. As for using a block plane instead of a bevel up bench plane to smooth large surfaces – the ergonomics would kill my hands and wrists, especially at high bevel angles (which is one of the primary benefits of the design), but you’re right, a block plane will work fine otherwise. I do think the flexibility of the design and improved materials and processes will keep it around this time. I don’t have anything against the #62, I just don’t see the point for most woodworking. Other than for the intended purpose of the original, leveling off end grain butcher block, it just seems to be the wrong tool for the purpose to me. The bevel up planes lose the advantage of a chip breaker for wood that doesn’t plane easily. If you have large areas that don’t plane well even with a chip breaker, it generally means that you need to plane from another direction. Yes, you can go to a higher pitch, but if the wood is that nasty, better to just forego the bench plane and head off to scraper land. Also toothing planes do well for the extra nasty stuff. I agree, for most woodworking it isn’t an advantage. It’s exactly the times you point out, end grain (low angle) and burly, swirling grain (hi angle) that the design works so well. Yes, BD planes with higher angle frogs are available, at $400 or so. A blade for a Veritas LA jack is <$50, and can be made any angle needed. The same plane can be used for a lot of the other “most woodworking” tasks as well. The versatility of the design is the point.